Anniversaries provide opportunities to look back at the distance traveled and forward to the road ahead. 2012 is WAGS’ 25th Anniversary! That’s 25 years of serving people with physical disabilities, helping them achieve higher levels of independence through partnerships with skilled service dogs. 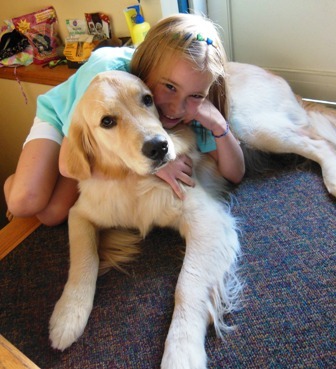 WAGS has placed over 100 dogs, and impacted over 100 lives that were changed forever by that special companion. These statistics embody the mission and the work that has provided both continuity and focus to WAGS from the time of its inception in 1987, through the many changes in personnel and policy that growth requires. Approximately 40 WAGS human/dog teams are currently living in and around Dane County, including almost 30 dog placements made in the last 5 years. In mission and in work, WAGS remains very much the same organization it was when it began. Another way that WAGS continues traditions began in its early years, is its reliance on a core group of passionate, committed volunteers. Today, as in the past, WAGS could not fulfill its mission without the dedication of these special individuals. While larger service dog organizations maintain kennels and employ professional trainers, WAGS has always, out of principle and need, depended on volunteers to both care for and train its puppies and dogs. Today the WAGS staff continues to believe that dogs in training thrive and learn best in a home environment. Both puppy raising and advanced service dog training provide opportunities for community volunteers to enjoy a WAGS dog living in their home and to broaden their knowledge and skill in the world of dog training, all while helping create meaningful change in the life of someone with a physical disability. In addition to puppy raising and training, community members are involved as puppy/dog sitters, fund raisers, organizers/office volunteers and board members. Twenty years after its founding, the WAGS Board and Staff remain committed to the organization’s original mission, to the strong tradition of volunteerism that has served the organization well over the years, and to building upon past successes and learning experiences. In 2001, WAGS was recognized as a provisional member of Assistance Dogs International, a non-profit coalition of assistance dog organizations promoting industry standards and ethics. In 2003, WAGS moved from a small office in Windsor, WI to its new training facility on Madison’s near-east side, allowing both administrative and training functions to coexist under one roof. In addition to continued pursuit of sound professional practices, future administrative and programmatic goals include providing a solid foundation for WAGS’ financial growth, as well as a further commitment to quality service-dog placements through puppy temperament testing, canine behavior evaluation and follow-up with human/dog teams. As a small, local agency, WAGS’ strength lies in providing outstanding, personalized service to its clients, and engaging the community in its work and mission. As WAGS looks to its future, these goals inspire us to continue this heart-expanding, life-changing work, knowing indeed the profound difference a dog can make. 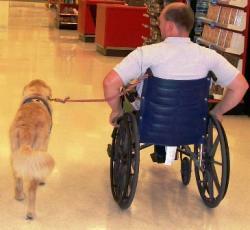 Click here to learn about our teams of humans and service dogs. We hope you enjoy reading what a difference these dogs make in the lives of so many people in our community. We’d love to talk with you about applying for a Service Dog, Family Service Dog, Home Helpmate, or Therapy Dog, volunteer opportunities or how to Apply for a Non-Graduate!